Britons' love of pies is set to help the market reach a value of more than £1bn by 2012, researchers say. Sales of pastry-based savouries are increasing by about 5% a year in the UK, says market research firm Mintel. It says the most popular item in what it calls the "pies and pasties" category is now the beef-filled pie - which has ousted the sausage roll as the number one choice. But pie popularity varies by region, the report added. Pies - not known for their healthy credentials - are typically referred to as comfort foods. However Vivianne Ihekweazu, senior food and drink analyst at Mintel, said they had also become fashionable. "While pies were often previously seen as being old fashioned, they have benefited from being repositioned as a popular gastro pub meal staple - moving them a step beyond the sausage roll in the eyes of the consumer as a versatile snack or viable main meal." Regional tastes play a part with people living in the Midlands - the home of the pork pie - more heavily dependent on pies than elsewhere, with 90% having eaten one in the past year, research suggests. Indeed, pies are such a strong regional feature, Leicestershire hosts an annual pie championship. 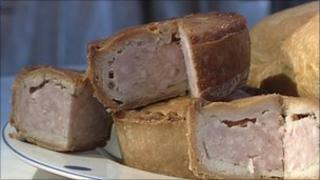 The pork pie market on its own is worth £145m a year, according to the Melton Mowbray Pork Pie Association. Judith Constable, from pork pie makers Dickinson & Morris, said their popularity was part of the trend towards locally sourced foods. "We are seeing consumers returning to traditional British foods such as pork pies and looking for authentic regional products with a long heritage," she added. But Mintel warns tradition alone will not be enough to keep people buying pies. "For future growth to stay strong, manufacturers will also need to reformulate their pie and pasty ranges, making them healthier, with the use of natural ingredients," Ms Ihekweazu advised.